Saturday May 24, Bolivian president Evo Morales was scheduled to appear in the town to announce some the delivery of some new ambulances and some government funding for local projects. Morales is an Aymara Indian, the first indigenous president in Bolivia’s history. 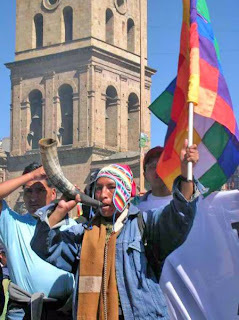 Bolivia’s population is two-thirds indigenous, mainly Quechua and Aymara. The people of the western highlands, who are in the main indigenous, were the key to the surprise election victory of his party Movement to Socialism (MAS) in 2004. The racist mob which attacked his supporters in Sucre, are part of a movement rooted in the European minority of Bolivia, resentful of Morales’ attempt to redistribute wealth in the country. Central to that redistribution is a new constitution that will allow greater access to the land for the indigenous majority. This majority has been fighting for equality for centuries. It took a revolution in 1952 to abolish a system called “pongaje” that was a kind of feudalism, in which the indigenous people had few rights, and were virtually slaves to European landowners. The referendums all are couched in demands for “autonomy.” These demands are accepted uncritically in most of the western media. More balanced coverage is available from Al Jazeera. The threat of withholding the natural gas reserves is now a central issue. The next referendum will take place June 21 in natural gas rich Tarija – centre of most of Bolivia’s gas reserves. The support of Venezuela will be crucial in the coming months. These referendums are not just a cover for the European elite in Bolivia – they are seen by US imperialism as a vehicle for undermining the new sovereignty movements that are challenging its hegemony everywhere in Latin America. Respected analyst Eva Golinger has convincingly documented that two agencies notorious for undermining popular movements in Latin America – USAID and the so-called “National Endowment for Democracy” – are deeply involved in supporting the “autonomy” movement. We all have a stake in the desperate struggle underway in this, the poorest country in South America. It was in Bolivia in 1999, that the poor rose up and delivered a central blow against neoliberalism, when a mass movement in Cochabamba stopped the privatization of water. If the forces of neoliberalism and imperialism succeed in reversing this movement, all the people of the Americas will suffer, not just the poor and the oppressed in Bolivia.